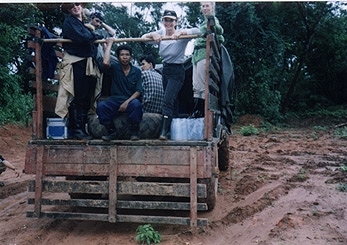 On the rugged road to Vilabouli (Vilaburi), left to right: Producer Denise Blazek from Perth, Australia; Soundman Martin Geissmann from Bangkok, Thailand; a Laotian guide; Soukhasavanh Sanaphay, Vientiane Ministry of Foreign Affairs Press Department; Reporter Linda Moulton Howe; Associate Producer Jax Hayes, Bang Productions Ltd., Hong Kong. Photograph by Videographer Brad Dillon from Hong Kong. July 12, 2001 Xepon, Laos - On June 29, the Bang Productions Ltd. crew, Phoudai Travel representatives, Mr. Soukhasavanh Sanaphay of the Vientiane Ministry of Foreign Affairs Press Department and I got into an old Soviet military truck in Xepon, Laos to follow the trail of "wildmen" sightings.